Illinois has had two official state flags. The first was officially adopted on July 6, 1915, after a vigorous campaign by Mrs. Ella Park Lawrence, State Regent of the Daughters of the American Revolution. Early in 1912, Mrs. Lawrence began visiting local D.A.R. chapters throughout Illinois seeking cooperation in promoting selection of an official state banner to place in the Continental Memorial Hall in Washington, DC. A prize of $25 was offered to the Chapter submitting the best design for the banner and four judges were selected to choose the winner. Thirty-five designs were submitted and the Rockford Chapter entry designed by Miss Lucy Derwent, was chosen. State Senator Raymond D. Meeker introduced the bill which was to legalize the flag. The measure passed both Houses of the General Assembly and automatically became a law on July 6, 1915, when Governor Edward F. Dunne failed to affix his signature to the bill. The move to design a new state flag was initiated by Chief Petty Officer Bruce McDaniel of Waverly, then serving in Vietnam. The Illinois flag was one of many state flags which were hung on the walls of his mess hall; its identity was always questioned, so McDaniel requested that the flag carry the state's name. A bill to amend the original flag act of 1915 was sponsored by Representative Jack Walker of Lansing and was passed by the General Assembly and approved by Governor Richard B. Ogilvie September 17, 1969. This authorized a new flag to carry the word "Illinois". Governor Ogilvie appointed a committee consisting of the State Historian, the Director of the Illinois Information Service, and the State Records Archivist to develop specifications for the new state flag to ensure uniformity in reproduction of design and color by flag makers. Mrs. Sanford Hutchison of Greenfield who had previously done extensive research on the official design of the state seal, submitted a flag which contained all the required elements of the design as specified by law, this was accepted by the committee, the Secretary of State and the Governor; on July 1, 1970, it became the official flag of Illinois. The state flag of Illinois shows the emblem portion of the official state seal on a field of white. Beneath the seal is the word "Illinois" in blue. The state flag includes the emblem of the official state seal with a white background. The word "Illinois" is located beneath the seal in blue letters. In it's history, Illinois has had two state flags. Information taken from the Illinois Blue Book, 1995-1996 edition, says that the first flag was adopted in 1915. Over 50 years later, an Illinois soldier serving in Vietnam suggested that the word "Illinois" be added to the flag so that there would be no question as to whose state flag was flying. Representative Jack Walker of Lansing sponsored a bill to amend the original Flag Act of 1915. This bill was passed by the General Assembly in 1969, and on July 1, 1970 the current flag became the state's official flag. 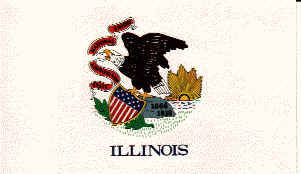 The Seal shown above is the third design of the State Seal and the fourth overall design for an Illinois Seal. The Secretary of State is the keeper of the keeper of the Great Seal. The State Seal can only be reproduced or used in strict accordance with the provisions of Chapter 1 of the Illinois Compiled Statutes. The first seal used in what is now Illinois was the seal of the Northwest Territory in 1788. Shortly after the Illinois Territory gained statehood in December 1818, the First General Assembly of the state decreed that state officials should procure a permanent State Seal. Like the Territorial Seal, the first State Seal was based on the Great Seal of the United States. However, unlike the Territorial Seal, the First (and subsequent) State Seals shows the eagle with a banner reading "State Sovereignty, National Union" in its mouth. 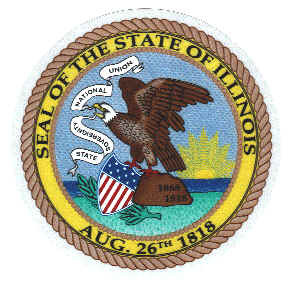 The words "Seal of the State of Illinois" and the date "Aug. 26, 1818" appear between the inner and outer circles on the seal. The date refers to the date that the first Illinois Constitution was signed in Kaskaskia. The Second Great Seal of the State of Illinois was a slight modification of the First. The eagle's wings were reduced somewhat, and the field of stars around the eagle's head were removed. Until 1868 the Second Great Seal was the one in use. In January 1867 Secretary of State Sharon Tynsdale told State Senator Allen C. Fuller that a new seal was needed. He asked Senator Fuller to sponsor a bill to authorize that new seal. In the bill that Fuller sponsored, Tynsdale proposed changing the wording on the banner the eagle held to "National Union, State Sovereignty" from the original "State Sovereignty, National Union." The wording change proposal was in response to the states rights controversy that was critical to the, then recently, settled Civil War. The Senate disagreed with Tynsdale's proposed wording change. A new State Seal was authorized of March 7, 1867; however, the amended bill restored the original wording. Although Tynsdale followed the General Assembly's decree that he not reverse the wording, he redesigned the seal in such a way that the words "National Union" are more prominent than the words "State Sovereignty." The present Great Seal of the State of Illinois is essentially unchanged from the one produced by Tynsdale. The date 1818 on the present Seal refers to the year Illinois became a state. The date 1868 refers to the date the seal was redesigned. The shield carried by the eagle shows thirteen stars and stripes representing the original states.